The Essen Crown (German: Essener Krone) is an Ottonian golden crown in the Essen Cathedral Treasury. It was formerly claimed that it might have been the crown with which the three-year-old Otto III was crowned King of the Romans in 983, which is the source of its common name, the Childhood Crown of Otto III (Kinderkrone Ottos III). However, this idea most probably derives from the wishful thinking of early twentieth century historians of Essen and it is now widely rejected. However it is certainly the oldest surviving lily crown in the world. In its shape the crown recalls a Byzantine circlet. The band is 3.5 cm wide and its diameter is now 12.5 cm, having been adjusted to fit the head of the Golden Madonna. A regular border of precious stones runs along the whole circumference. The main circlet is made of gold which has been heavily alloyed with silver; a second circlet of pure gold has been soldered onto the outside. An iron reinforcing ring is visible on the outside. The upper and lower edges of the crown are decorated with pearls strung on a metal wire attached to the circlet by metal rings. Numerous pearls and gemstones decorate the main body of the crown and the lilies, with particularly precious stones placed directly under the lilies. Highlights include a Late Antique engraved gem depicting the head of Medusa and a sapphire in a triangular gold ring at the front of the crown. Comparable (but later) crowns are in the possession of the church treasuries of Hildesheim and Conques in France. The origin of the crown is unclear. For a long time it was claimed that the crown was made for the coronation of Otto III in 983 and had been gifted to Essen Abbey by him. Essen Abbey, under the leadership of Abbess Mathilde, who was a granddaughter of Otto I, had a particularly close relationship to the Ottonian royal family, as demonstrated by significant donations by the kings and also in the fact that the sister of Otto III (who like the Abbess was also called Mathilde) was educated at Essen. At the beginning of February 993, therefore, Otto III made a visit to the Abbey of Essen for Candlemas, at which time local historians suggested that he made two major donations. The first of these was a sword of Damascus steel which was probably made in 950 and shows signs of use on the blade. This sword was venerated, probably on account of its former owner, and an expensive golden sheath was made at Essen for the sword. In later times the sword was reputed to be the Sword of Saints Cosmas and Damian and was included in Essen's civic coat of arms. For modern scholarship, a better understanding of the relationship of Essen Abbey and the Ottonian family provided an answer to the question of who the original owner of the sword really was. Otto III's second gift might have been the golden crown. Written evidence for this is lacking, but there were circumstantial arguments for it. Firstly, based on art historical comparisons, the crown was dated to the end of the tenth century. The existence of the iron reinforcing ring was taken as evidence that the crown had been reworked for the Golden Madonna's head and, therefore, had originally been designed for another purpose, which it was concluded could only have the coronation of a child, since it would still have been too small for an adult. The coronation of Otto III in 983 at Aachen Cathedral is the only coronation of a child which occurred within the right time period. Furthermore, the medieval practice of crowning a statue of Madonna on 2 February during Michaelmas is first attested at Essen. Thus it was suggested that the practice commemorated the gift of the crown to the abbey during his visit to Essen at the beginning of February 993, which would have coincided with the feast day. Modern dating puts the modification of the crown in the middle of the eleventh century. At that time several of the artworks at Essen were modified: the Cross of Theophanu and the Theophanu reliquary of the Holy Nail were decorated enamels and the halo of the Golden Madonna which made it difficult to crown the statue was removed. This suggests that the crowning ritual originated only a little before this, probably around 1040/50. In current scholarship it is thought that the crown itself dates to the beginning of the eleventh century on account of the decorative elements known as lilies and beehives, which are very similar to artworks made at the time of Henry II. Such artworks in the Essen Cathedral Treasury include the ends of the cross with the large enamels, which is believed to have been created under Abbess Sophia (1011–1039). In that case, the crown would have originally been made for the ritual coronation of the golden Madonna. Furthermore, the regularity of the crown's decoration makes it unlikely that it was ever actually resized. Sometimes the crown is now even dated to the latter half of the eleventh century. For centuries, nothing important happened to the crown. Then, in 1988, it was depicted on a charity stamp of the Deutsche Bundespost as an outstanding example of Ottonian goldsmithery. Georg Humann. Die Kunstwerke der Münsterkirche zu Essen. Schwann, Düsseldorf 1904, pp. 261–266. Alfred Pothmann. "Der Essener Kirchenschatz aus der Frühzeit der Stiftsgeschichte." In: Herrschaft, Bildung und Gebet. Gründung und Anfänge des Frauenstifts Essen. Klartext, Essen 2000, ISBN 3-88474-907-2, pp. 135–153. Birgitta Falk. "Essener Krone" In Gold vor Schwarz. Der Essener Domschatz auf Zollverein, edited by Birgitta Falk, Exhibition Catalog 2008. Klartext Verlag, Essen 2008, ISBN 978-3-8375-0050-9, pp. 92–93. Essen Crown on the website of the Essen Cathedral Treasury. The Ottonian dynasty was a Saxon dynasty of German monarchs (919–1024), named after three of its kings and Holy Roman Emperors named Otto, especially its first Emperor Otto I. It is also known as the Saxon dynasty after the family's origin in the German stem duchy of Saxony. The family itself is also sometimes known as the Liudolfings (Liudolfinger), after its earliest known member Count Liudolf and one of its primary leading-names. The Ottonian rulers were successors of the Germanic king Conrad I who was the only Germanic king to rule in East Francia after the Carolingian dynasty and before this dynasty. Theophanu, was an Empress consort of the Holy Roman Empire by marriage to Holy Roman Emperor Otto II, and regent of the Holy Roman Empire during the minority of her son from 983 until her death in 990. She was the niece of the Byzantine Emperor John I Tzimiskes. Otto II, called the Red (Rufus), was Holy Roman Emperor from 973 until his death in 983. A member of the Ottonian dynasty, Otto II was the youngest and sole surviving son of Otto the Great and Adelaide of Italy. Essen is the central and second largest city of the Ruhr, the largest urban area in Germany. Its population of 583,393 makes it the ninth largest city of Germany, as well as the fourth largest city of the federal state of North Rhine-Westphalia. On the Ruhr and Emscher rivers, Essen geographically is part of the Rhineland and the larger Rhine-Ruhr Metropolitan Region. The Ruhrdeutsch regiolect spoken in the region has strong influences of both Low German (Westphalian) and Low Franconian. Ottonian art is a style in pre-romanesque German art, covering also some works from the Low Countries, northern Italy and eastern France. It was named by the art historian Hubert Janitschek after the Ottonian dynasty which ruled Germany and northern Italy between 919 and 1024 under the kings Henry I, Otto I, Otto II, Otto III and Henry II. With Ottonian architecture, it is a key component of the Ottonian Renaissance. However, the style neither began nor ended to neatly coincide with the rule of the dynasty. It emerged some decades into their rule and persisted past the Ottonian emperors into the reigns of the early Salian dynasty, which lacks an artistic "style label" of its own. In the traditional scheme of art history, Ottonian art follows Carolingian art and precedes Romanesque art, though the transitions at both ends of the period are gradual rather than sudden. Like the former and unlike the latter, it was very largely a style restricted to a few of the small cities of the period, and important monasteries, as well as the court circles of the emperor and his leading vassals. The Golden Madonna of Essen is a sculpture of the Virgin Mary and the infant Jesus. It is a wooden core covered with sheets of thin gold leaf. The piece is part of the treasury of Essen Cathedral, formerly the church of Essen Abbey, in North Rhine-Westphalia, Germany, and is kept on display at the cathedral. Essen Abbey was a monastery of secular canonesses for women of high nobility in Essen, Germany. It was founded about 845 by the Saxon Altfrid, later Bishop of Hildesheim and saint, near a royal estate called Astnidhi, which later gave its name to the religious house and to the town. The first abbess was Altfrid's kinswoman, Gerswit. Quedlinburg Abbey was a house of secular canonesses (Frauenstift) in Quedlinburg in what is now Saxony-Anhalt, Germany. It was founded in 936 on the initiative of Saint Mathilda, the widow of King Henry the Fowler, as his memorial. For many centuries it and its abbesses enjoyed great prestige and influence. Gandersheim Abbey is a former house of secular canonesses (Frauenstift) in the present town of Bad Gandersheim in Lower Saxony, Germany. It was founded in 852 by Duke Liudolf of Saxony, progenitor of the Liudolfing or Ottonian dynasty, whose rich endowments ensured its stability and prosperity. Essen Minster, since 1958 also Essen Cathedral is the seat of the Roman Catholic Bishop of Essen, the "Diocese of the Ruhr", founded in 1958. The church, dedicated to Saints Cosmas and Damian and the Blessed Virgin Mary, stands on the Burgplatz in the centre of the city of Essen, Germany. 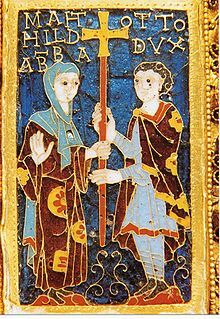 Sophia I, a member of the royal Ottonian dynasty, was Abbess of Gandersheim from 1002, and from 1011 also Abbess of Essen. The daughter of Emperor Otto II and his consort Theophanu, she was an important kingmaker in medieval Germany. 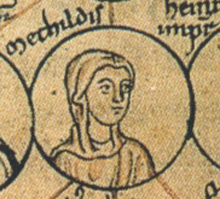 Matilda of Germany or Matilde of Saxony was the third daughter of Otto II, Holy Roman Emperor and his wife, Empress Theophanu. The Sword of Saints Cosmas and Damian, also known as the Sword of Essen, is a ceremonial weapon in Essen Abbey. The sword itself dates to the mid 10th century, the gold decoration was added at the close of the 10th or the onset of the 11th century, while the silver mounts with the inscription were added 15th century. The Essen Cathedral Treasury is one of the most significant collections of religious artworks in Germany. A great number of items of treasure are accessible to the public in the treasury chamber of Essen Minster. The cathedral chapter manages the treasury chamber, not as a museum as in some places, but as the place in which liturgical implements and objects are kept, which continued to be used to this day in the service of God, so far as their conservation requirements allow. The Cross of Otto and Mathilde, Otto-Mathilda Cross, or First Cross of Mathilde is a medieval crux gemmata processional cross in the Essen Cathedral Treasury. It was created in the late tenth century and was used on high holidays until recently. It is named after the two persons who appear on the enamel plaque below Christ: Otto I, Duke of Swabia and Bavaria and his sister, Mathilde, the abbess of the Essen Abbey. They were grandchildren of the emperor Otto I and favourites of their uncle, Otto II. 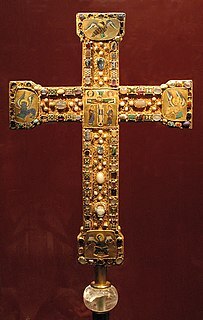 The cross is one of the items which demonstrate the very close relationship between the Liudolfing royal house and Essen Abbey. Mathilde became Abbess of Essen in 973 and her brother died in 982, so the cross is assumed to have been made between those dates, or a year or two later if it had a memorial function for Otto. Like other objects in Essen made under the patronage of Mathilde, the location of the goldsmith's workshop is uncertain, but as well as Essen itself, Cologne has often been suggested, and the enamel plaque may have been made separately in Trier. Mathilde was Abbess of Essen Abbey from 973 to her death. As granddaughter of Holy Roman Emperor Otto the Great she was a member of the Liudolfing dynasty and became one of the most important abbesses in the history of Essen. She was responsible for the abbey, for its buildings, its precious relics, liturgical vessels and manuscripts, its political contacts, and for commissioning translations and overseeing education. In the unreliable list of Essen Abbesses from 1672, she is listed as the second Abbess Mathilde and as a result, she is sometimes called "Mathilde II" to distinguish her from the earlier abbess of the same name, who is meant to have governed Essen Abbey from 907 to 910 but whose existence is disputed. 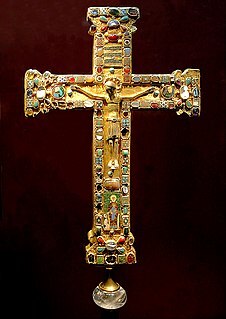 The Cross of Mathilde is an Ottonian processional cross in the crux gemmata style which has been in Essen in Germany since it was made in the 11th century. It is named after Abbess Mathilde who is depicted as the donor on a cloisonné enamel plaque on the cross's stem. It was made between about 1000, when Mathilde was abbess, and 1058, when Abbess Theophanu died; both were princesses of the Ottonian dynasty. It may have been completed in stages, and the corpus, the body of the crucified Christ, may be a still later replacement. The cross, which is also called the "second cross of Mathilde", forms part of a group along with the Cross of Otto and Mathilde or "first cross of Mathilde" from late in the preceding century, a third cross, sometimes called the Senkschmelz Cross, and the Cross of Theophanu from her period as abbess. All were made for Essen Abbey, now Essen Cathedral, and are kept in Essen Cathedral Treasury, where this cross is inventory number 4. The Cross with large enamels, or Senkschmelz Cross, known in German as the Senkschmelzen-Kreuz or the Kreuz mit den großen Senkschmelzen is a processional cross in the Essen Cathedral Treasury which was created under Mathilde, Abbess of Essen. The name refers to its principal decorations, five unusually large enamel plaques made using the senkschmelz technique, a form of cloisonné which looks forward to champlevé enamel, with a recessed area in enamel surrounded by a plain gold background, and distinguishes it from three other crosses of the crux gemmata type at Essen. The cross is considered one of the masterpieces of Ottonian goldsmithing. The Cross of Theophanu is one of four Ottonian processional crosses in the Essen Cathedral Treasury and is among the most significant pieces of goldwork from that period. It was gifted by Theophanu, Abbess of Essen, who reigned from 1039 to 1058. Theophanu was the abbess of the convents of Essen and Gerresheim from 1039 until her death in 1058. She was the daughter of Matilda of Germany and a granddaughter of the Byzantine princess Theophanu and the Holy Roman Emperor Otto II.